Come home to the best in high-rise apartment living in Houston at Camden Post Oak and relish in sophisticated, luxury living in the Houston Galleria. Our one, two and three bedroom apartment homes are the largest in the Uptown, Galleria area - with each floor plan boasting close to 200 square feet more than nearby high-rises. 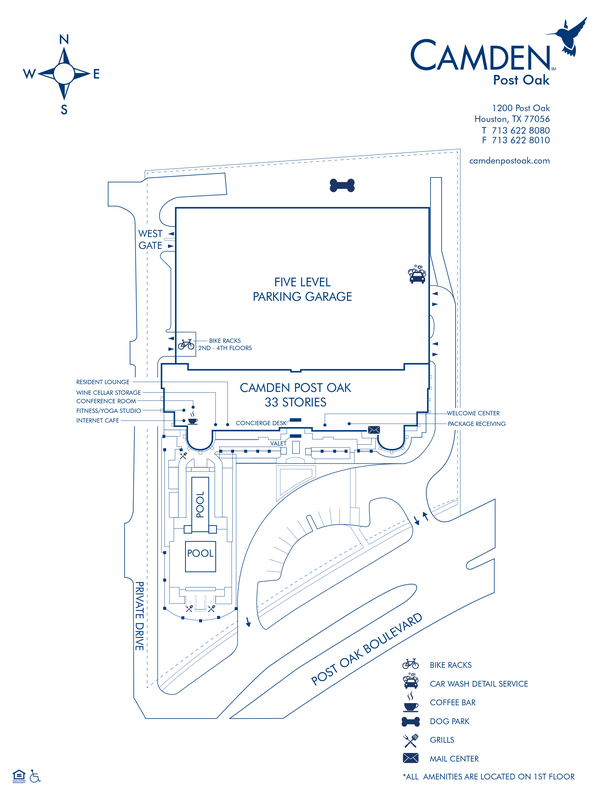 Camden Post Oak also offers penthouses with 3 bedrooms and 3 baths and more than 3,400 square feet of space. View our available floor plans. We all love the iconic Houston skyline, but it's so much better from your couch or bed (just trust us on that one), especially when you live on the top floor! Check out everything that comes with Houston Galleria penthouse living in one of our two available penthouses! Featured in The Best of Houston on Apartminty.com, our 33 floors offer breathtaking, skyline views of Uptown and Downtown Houston from floor to ceiling windows. Relax and let us take care of your every need with our 24-hour concierge and complimentary valet. A 24-hour fitness center including fully-equipped yoga studio, executive conference room, and even valet dry cleaning services guarantee that you will enjoy a stress-free, luxury apartment lifestyle at Camden Post Oak. Entertain your neighbors and friends from the comforts of your own home by utilizing the social lounge complete with gourmet kitchen or at one of the two resort-style pools that have lush landscaping, water features, and sundecks. Camden Post Oak is a pet-friendly high-rise apartment community and offers a one-of-a-kind, fenced-in, private dog park with pet washing station. Located in Uptown Houston, Camden Post Oak apartments and penthouses are at the heart of the city’s finest cuisine, shopping and entertainment found at neighboring Uptown Park and the Galleria. Take a quiet stroll to The Fresh Market Store for groceries or The Tasting Room for Happy Hour. If you’re looking to venture out of Uptown or the Galleria area, Camden Post Oak is just minutes from Downtown Houston, Rice Village, the Museum District, the Historic Heights district and the Houston Medical Center. For your daily commute, easily hop on nearby highways US-59, I-10, and I-610. Residents receive a technology package included in the total monthly rent with a savings of up to 53% off retail. This money-saving package includes high-speed internet up to150 Mbps and over 140 digital video channels, 80 HD channels, and the full multiplex of HBO through Xfinity. Use the Xfinity Go app on your smartphone or tablet to access your digital video anywhere! The good life in the Galleria is waiting for you. Come home to Camden Post Oak. Restricted breeds: American Pit Bull Terrier, American Staffordshire Terrier, Staffordshire Bull Terrier, rottweiler, Chow Chow, Doberman Pinscher, Bullmastiff, German Shepherd, Wolf Hybrid, any mix of the previous breeds, or any other dog or breed deemed aggressive. Assigned parking and open parking available. Private garages and garages with storage are available to rent.